So, there must be something in Hollywood's drinking water! We have been seeing a lot of Celebrity's galpals carrying Balenciaga lately. This time it is Whitney Port's sister is carrying a white Giant City with a navy suede body. What's interesting about these bags it that they have Gunmetal hardware, which was also used on Neiman Marcus's Limited Edition Turquoise City in 2007 (a stunning combination). This bag was released in early 2008 season, and I do recall hearing about these going on sale at Nordstrom a while ago. I am a fan of the Toile and Damask Canvas bags from 2006, but one negative thing about it is that the suede will eventually fuzz from wear as opposed to leather. Port & sister is seen here shopping at Westfield Mall in Century City on Saturday. This Sahara Giant Covered Hardware Velo is looking mighty good! I'm not usually a fan of beige/tan bags, so I'm guessing its the lavender background against it is making it suddenly more appealing! Anywho, thought I'd throw this in because its beautifully photographed. And because I love Bal Ads. Click the Ad if you want to go directly to the Barneys website. This time Rebecca Gayheart isn't carrying her beautiful 03 Pewter Hardware City, but her friend is carrying what looks like an older red city without the shoulder strap (kind of hard to tell since the picture is small). Though I like my shoulder straps attached my bags, because it feels naked without it, haha. This picture is taken on January 29, while the two were leaving Cafe Med together in Los Angeles, CA. Sorry, I'm a little late posting this as I was not sure if it was allowed, but since someone posted it on a public forum, I guess it would be okay to put it here. If not, let me know! HgBags is getting in some oldies!! I haven't been able to pre-order or confirm anything as she is already backed up with hundreds of emails, but there are some great finds that have been retired. I hope to get a magenta SGH coin to replace the Sorbet coin purse I canceled. HAPPY FRIDAY! 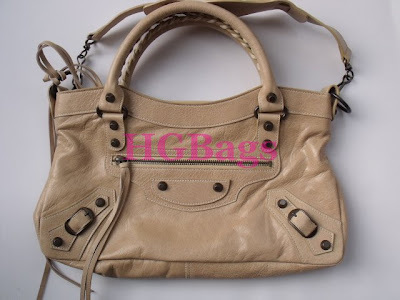 You will not believe your eyes at this list of coming arrivals from Balenciaga to HGBags! Many many of the colors from 08 and 09 that you are all asking about on a daily basis, even including Gold HW, that we can rarely acquire. This is truly a rare opportunity to find these SOLD OUT, RETIRED colors that are BRAND NEW, never worn, BELOW RETAIL!!! FULL Payment (FREE SHIPPING will be offered to anyone that reserves ahead of time) will be required at this time to hold an item, but will be REFUNDABLE in full if you are not pleased with the photos when the item arrives to us. When it arrives, photos will be sent out and you can confirm your item at that time. 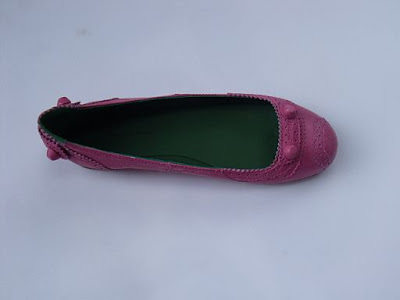 If you are not pleased with your item from the photos, we will work diligently with you to find another leather choice or refund your full payment - there will be multiples of most items, so again we will do our best to accomodate any leather requests. Payments will be taken via paypal, googlecheckout, credit card, money order, western union or bank wire. We know a lot of you have been anxiously waiting for the Outremer and it’s finally here!! Plus a lot of other goodies!!! Even though it's kind of hard to make out, it appears that Jayde Nicole's galpal is carrying a Galet day. If I find a better picture, I'll post it! They were spotted shopping at Kitson in LA on Janary 28, 2010. Don't really care for Jayde's outfit, but I really like her friend's off shoulder sweater. Cute, goes with her bag. Rebecca Gayheart was spotted again on January 28 out shopping in LA. 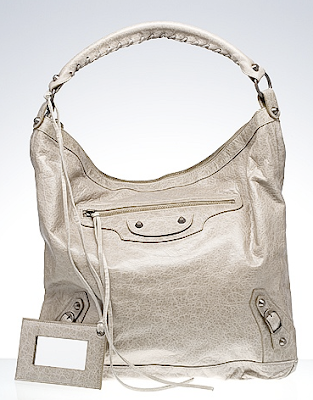 The soon to be mommy is seen here carrying her yummy Balenciaga Pewter Hardware City *drool*. It has the perfect slouch to it, and the leather must be fabulous to the touch. It looks like she has also paired a Louis Vuitton Epi Zippy Wallet in a purple hue (I want to say its official color is "Cassis", but I'm not 100% sure, so correct me if I'm wrong.) But all I can say about her bag is, WANT IT. Nicole Richie is spotted here in West Hollywood, CA on January 26, 2010 going out to dinner. Not everyone can pull off the messy, raggedy look, but she totally can rock it! She looks cute by pairing gray skinny jeans with black booties. I'm not a huge fan of the printed drape cardigan, but the red scarf pulls the entire look together by adding a pop of color. Of course her black City is present too! Balenciaga.com has finally updated their website with some new colors! It looks like they have most of the colors in except for Canard, Mustard, and Olive. It looks like a mini Giant Handle Flat Clutch! Will you end up getting anything off the site? British beauty, Kate Beckinsale was seen on January 24, 2010 carrying a Tempete/Storm GSH City from the 2009 collection. Kate, hubby Len, and daughter Lily were out with friends in Santa Monica, CA. Interestingly enough she wears her City sans shoulder strap. When I carry my City, I almost always use the shoulder strap at some point during the day! I really love the color Tempete as it's distressing can vary from really marble-y or nice and smooth. It is a blue with grayish undertones and can make a nice neutral when you want it to be. Kate is absolute perfection! I love her and her style. I've decided to take some pictures of my Bals and they came out pretty nice! 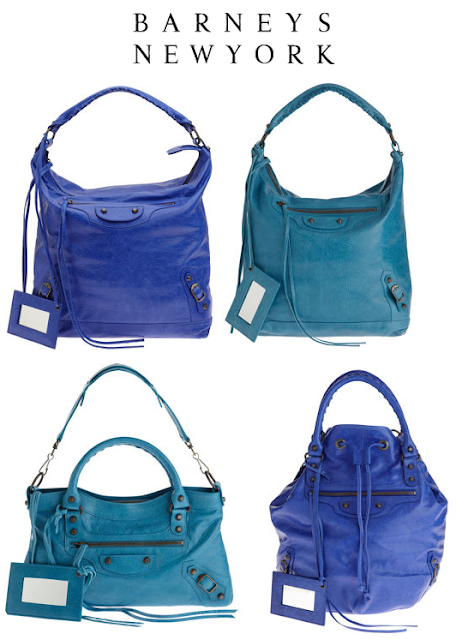 The hunt for these bags is so addicting, the desire for a multitude of colors is overwhelming! I've had Bal fever since 06, went on a hiatus when I was pregnant with my son, and hopped on board again when I couldn't fill my desire with a Longchamp le pliage tote. I tried to get off Bal, but I just couldn't! This is why I love blogging about these bags, the leather is so amazingly soft and squishy, and not one are alike. I don't think I will ever lose interest in these bags. Ever. Is it just me or do these bags look insanely saturated in color? Of all the pictures I have seen so far of the spring 2010 collection, Barneys' pictures are the most beautiful. I don't know if they have good lighting or an amazing photographer, but I am tempted to see if these are really that nice in real life. These pictures are very reminiscent of 2005's color saturation! What's interesting is that I also see a Truffle work still available on their site, and I think that is from 2006. I hope it isn't an error and instead they're sending out Charbon works. Check out Barney's newest stuff here. My most favorite winter time shoe has to be Uggs. They are so comfortable and warm, and are cute, but not really fashionable. When it comes to clothing and shoes, I guess I am more of the "dress for comfort type". Hilary Duff is spotted here on January 21 shopping in Brentwood, CA. She pairs a black open cardigan with nice worn-in jeans tucked into her chestnut Uggs. Her black covered work bag has some interesting distressing, or it could be just the lighting? Either way, I'm a fan of her look! Casual yet very cute and put together. Nicole Richie has been spotted yet again out in Hollywood at a business meeting on Friday, January 22. I love the fact that she has paired gray skinny jeans tucked into Hunter Wellington boos, with a black blazer. She looks so fabulous without overdoing it. I am a fan of rain boots right now because of the crappy New England weather we have been getting. Let me just say that my Ugg boots are destroyed from the gross, wet snow. I am definitely looking into investing in a pair of rain boots! But! Let's not forget the main reason of this blog entry. The coveted black city bag that she has been seen wearing hundreds of times! Her city bag adds a special finishing touch to her outfit, a boho-chic element maybe? The way that it is so slouchy and just hangs lazily off her shoulder.. that bag's leather must feel like butter by now! Loves it! I adore her trendy style. I think I need a black blazer too now. Hollywood's notorious father of eight, Jon Gosselin has a new girlfriend. *gag* Morgan Christie has a what looks like either 04 pistachio city or 09 granny city that is nicely broken in. Almost a week ago, she was also seen carrying a very pretty white GGH City. In this picture, the duo has been spotted in Utah on January 22, Friday probably hitting up the slopes, since Jon is a snowboarding junkie. Don't get me wrong, I use to adore Jon as the doting, wonderful dad during the show (Jon & Kate +8) during the early seasons, but now his true colors have shown. Jon, you might have poor taste in girls, but at least she can pick out a nice hand bag when she sees one! HA. I'm not Team Jon nor Team Kate.. I am team Gosselin kids!!!!! Image via Celebrity-Gossip.net & Just Jared. Newly engaged Tara Reid is seen here with fiance Michael Axtmann. I don't love her t-shirt as it reminds me of the plastic bags I get with my take out meals, but loving the giant city! I will never own one because I did at one point and it was too heavy because of all the hardware. I purchased a Canon Rebel camera and I decided to post a couple modeling pictures of my blue india city and violet gsh day. I haven't been carrying them a lot since the weather has been dreary and damp. I still have lots of love for them, and will start carrying them when the weather looks up. I don't have much color in my collection, but these are pretty much the only nice shades I own. For now here are the pictures! Enjoy! Hilary Duff must have read about my last post about her not using her Bals just for the gym! Haha. Here she is spotted today in Brentwood, CA leaving a medical building. She is carrying what appears to be a covered Giant Work in black. It looks amazing with her Jimmy Choo for Hunter rain boots which I would like to add to my shoe collection. Gray and black looks good on her I must say! Golden Globe Awards Winner Chloe Sevigny was spotted leaving LA carrying a black Covered Giant Hardware Office bag. This style is a newer one introduced around 2009 and has not been seen a lot carried by celebs. Kudos to Chloe for trying it out, and congrats to her for winning best actress! Former super model beauty, Claudia Schiffer who is pregnant with her third child is seen here on January 19, 2010 carrying a Sunday Patchwork tote! Though it hasn't been the greatest hit amongst Bal fans, it looks stunning on her. It really adds complexity to her simple outfit. This season the Sunday tote will come in all the spring colors. Anglo-French actress/songwriter Charlotte Gainsbourg was seen signing autographs before her appearance on the David Letterman show. She appears to be carrying either an Anthracite or Black Courier bag. 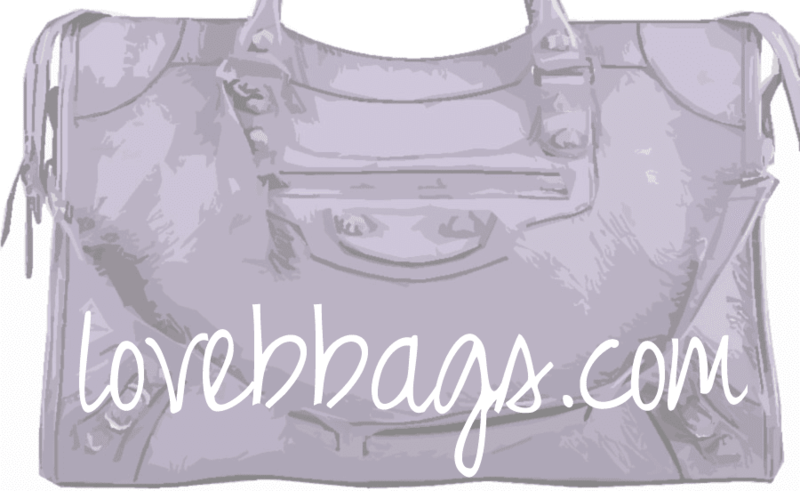 This bag makes a great night bag, very spacious and has a beautiful body conforming slouch when worn as a messenger. Gainsbourg will also be the face of the new Balenciaga fragrance, and is set to shoot the ad in Feb 2010. Read more about here. Here's another Bal celeb spotting! 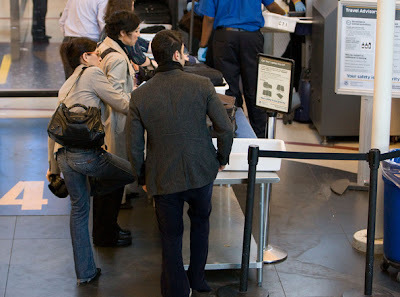 On January 18, 2010, Julianna Margulies was spotted catching a flight at LAX airport. What was her carry on bag? 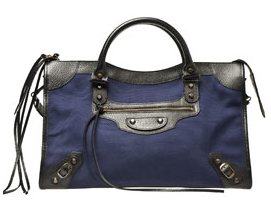 A Balenciaga Black City with Regular Hardware! Such a wise choice. You can never go wrong with a black city since it has been named a timeless classic. 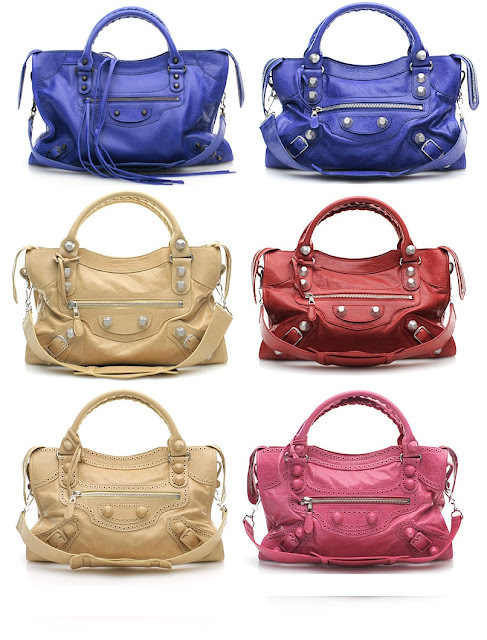 HgBags has marked down a few of their spring Balenciaga bags! 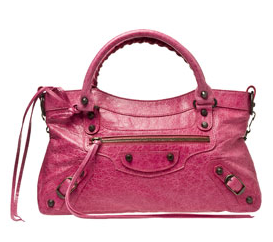 New markdowns just taken on Balenciaga Spring 2010 is an additional 10% off!!! See link below for all sale items. The pre-owned Praline Work that we are featuring has also been reduced! 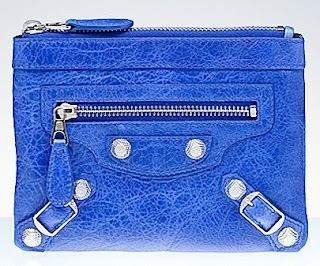 Don't miss out - this is a rare rare opportunity to find Spring 2010 handbags from Bal and BV at such amazing prices! Mary Kate Olsen still has some love for Balenciaga! Mary-Kate Olsen is seen here this week (January 14, 2010) still showing some love for Bal. She is spotted here going back to her Manhattan apartment wearing Bal's F/W 2006 Harness Booties. These are the hottest boots ever made, and they still look amazing on her in 2010! They have a slightly futuristic look with a beautiful ultra platform/heel. Balenciaga should definitely make these every season. Hope she'll decide to bring out one of her Bal bags soon.. pretty please MK? We know you have a fabulous collection of moto bags! 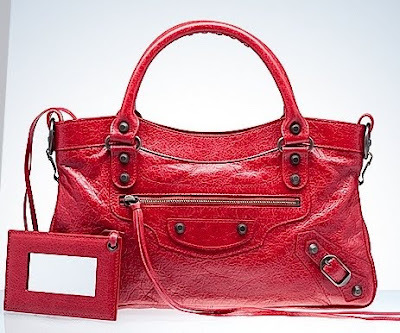 So Browns Fashion has finally decided to update their site with brand new Balenciaga goodies! Some have really caught my eye. 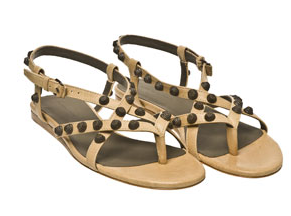 Something's that I haven't seen so far are the Papeete and Sahara studded sandals. It looks like they are going to produce them in every color! Something else really interesting that hasn't been really seen before is this canvas city. 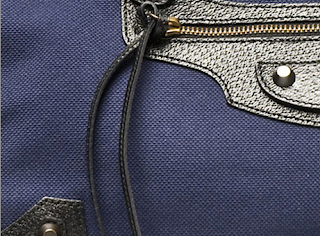 They've made some changes compared to canvas bags from previous years, I've noticed that the leather trimming is perforated, and they have sewn a seam down the tassels, perhaps it won't split as easily? The navy canvas doesn't impress me much as it reminds me of my boyfriend's mechanic uniform! And because I love pink, we'll put a picture of Brown's newly arrived Sorbet first! I'm still on a hunt for a beautiful first bag to my collection. Check out the new arrivals here at Browns. 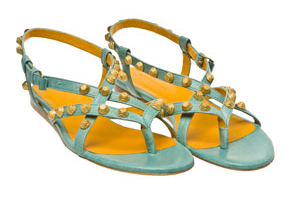 What do you think of the newest seafoam color? I think Papeete is a gorgeous spring color for 2010, and I have to admit that this hue is one of my most favorite greens aside from 2007 Vert D'eau, and 2004 Pistachio. I prefer Papeete with classic hardware, it's a great contrast against the aged brass. Seen here going to the Golden Globes gift lounge on January 14, 2010. I'm still trying to figure out which exact red and what year this bag is from! I wish she would get it cleaned up though, its so dirty! 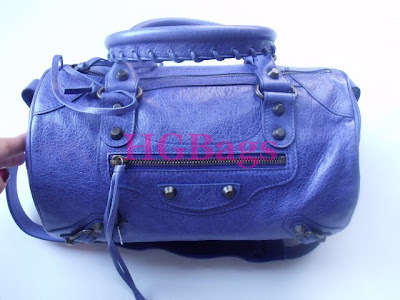 Today's Email from HGbags, Outremer, Cyclade, Papeete, Castagna! More Spring Bal 2010 arrivals! Outremer Drum is about the same size as the First. 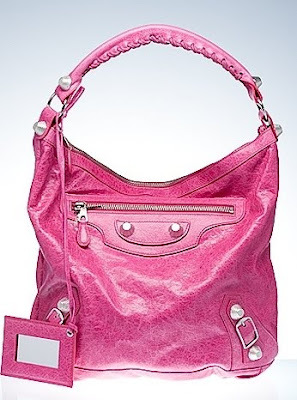 Just in from the new Balenciaga Spring 2010 collection! See our site for the latest adds - link below. Our apologies if the color appears different on various pieces in the same color. We do our best to always take pics in natural light and based on the amt of sunlight avail, photos will differ.